Well hello 2018 you beaut. It seems only yesterday I was celebrating your arrival, in da club with copious amounts of Prosecco. JOKES!!! I was in bed by 10:30 pm on New Years, if there is any chance that the way you spend the new year has any bearing on the following 364 days I wanted to be sure that sleep featured heavily. Now here we are, the end of month one, we’ve seen off “Blue Monday” and hopefully capitalised on the last of the seasonal sales. January has seen me really up my beauty game. I’ve followed a new skincare routine religiously, increased my hydration (I’ve tried desperately hard to reach for water before I have my first espresso), introduced mousse to my hair care routine and even lost my fake tan virginity. Today, I’m sharing my skincare favourites from January (I’ll tell you about the mousse and tan next month as I want to trial them for a little longer first). I apply one pump of this oil to dry skin (morning and evening). Upon massaging it into my skin it feels incredibly indulgent. It has a beautiful scent as it is infused with cleansing oils and botanicals. I then wet my hand and massage my face and neck further. This emulsifies with the oil and creates a deep cleansing effect. Finally, I wipe off with a warm flannel. My makeup literally melts off and requires no harsh rubbing to remove. It leaves my face feeling super clean and there is no residue whatsoever. Since using this (5 weeks) my skin has not been greasy, I’ve had only one pimple and my pores have shrunk considerably. Palmer’s recommend this product for all skin types. It is Ophthalmologist tested. Non Comedogenic. Dermatologist Tested. Safe for sensitive skin. Incredibly affordable and long lasting- in five weeks I have only used quarter of the bottle. The pump bottle can easily be opened and closed meaning its suitable for travel! As the weather in Australia has been insanely hot, there are days where I have been out a lot and reapplied sunscreen. On these occasions I follow with a second gel cleanser in the evenings. 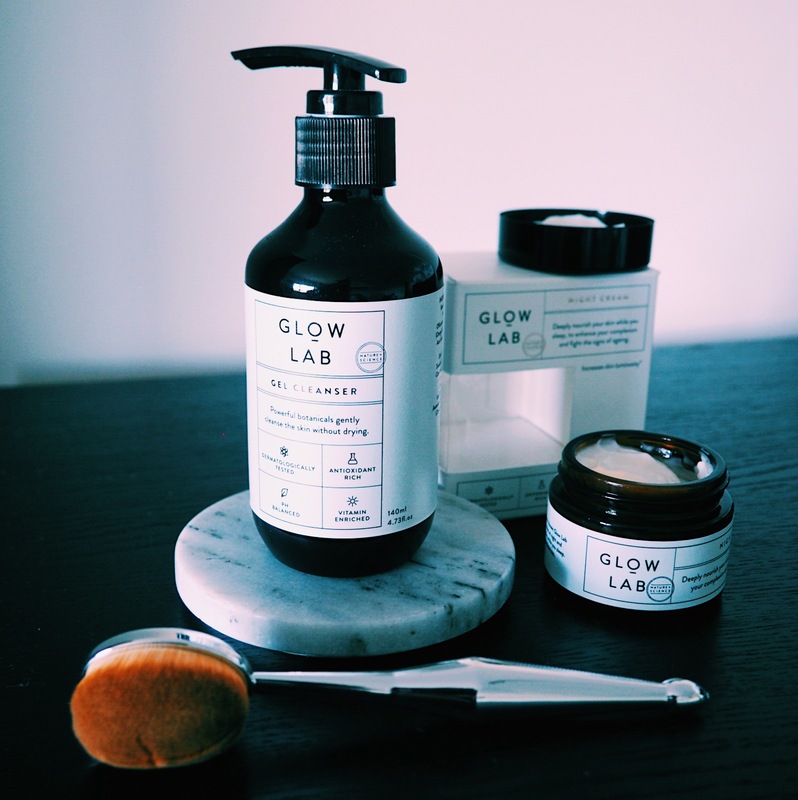 The Glow Lab philosophy is to combine the power of nature with science to create powerful and natural skincare. What can I say? Philosophy fulfilled! Bravo Glow Lab. Not only does your gel cleanser do an incredible job – it’s gentle, removes pollution, has antibacterial properties and is a natural astringent that doesn’t dry out my skin! The packaging is unbelievably chic. It looks expensive with its minimal style and brown “old apothecary” style bottle. I apply 1 pump of this to dry skin and then splash my face with warm water. I wipe off with a warm, soft flannel and pat my skin dry. Following this I apply my favourite serum which I reviewed in my post Beauty Review- My top beauty products from 2017. This cream is like the Hulk in a jar. It looks so basic, yet hidden inside is a whole host of t-shirt ripping powers (SuperOx-C™ (Kakadu Plum) which is a very rich source of Vitamin C , this is combined with Aloe Vera, Vitamin E and Glow Labs’ ProRenew Complex CLR™) these ingredients contribute to an increase in cell renewal and that means younger, brighter and altogether glowier (its a word trust me) skin. I apply a small amount of this potent cream using a light tapping technique. Its not at all thick or greasy. Despite sleeping right next to an awfully drying Air Conditioning unit, I awake with hydrated and radiant skin. Before bed, I finish my routine with this little tube of awesomeness. The result of a combination of 100% pure and natural Cocoa Butter, Shea Butter and Coconut Oil. This balm is rich and long lasting. I apply it to my lips and hands before I sleep and it works perfectly. My lips are still soft and moisturised when I wake up. Ive also found its great for the dry spots on my knees that I’ve acquired after kneeling down 108,667532 times a day to change nappies. Do you stick to a regular skincare routine? What challenges do you face when trying to maintain it? For me I struggle at the end of the day to find the motivation to follow through, I’ve found removing my makeup earlier in the evening works better for me. I then keep my serum and creams on my bedside table so theres really no excuse. Do you have any tips for sticking to a skincare regimen? The Glow Lab products sound awesome! And something about the packaging just catches my attention. I wish I could get them in the states! That’s how I discovered them, the packaging just grabbed me. Fingers crossed for global shipping soon!